He was named varadharAjar by his parents while he was born. He becomes a sishya of periyavAchAn piLLai at a young age and starts serving him at his thirumadappaLLi (kitchen). Once when he was about 32 years old, he observes a few vidhwAns discussing philosophy. Out of curiosity, he goes and asks them what they are discussing about. Those vidhwAns, knowing that varadharAjar is not knowledgable in basics, sarcastically say that they are discussing musalakisalayam (a non-existing grantham). They also chastise him saying that he does not understand any sAsthram since he was illiterate. varadharAjar goes to periyavAchAn piLLai and explain this incident. periyavAchAn piLLai says “since you are illiterate, they chastised you”. Being ashamed of himself, varadharAjar prays to periyavAchAn piLLai to teach him sAsthram. periyavAchAn piLLai, being most merciful, at once initiates him in to sAsthram and starts teaching him kAvya, nAtaka, alankAra, shabdha, tharkka, pUrva mimAmsa, uththara mImAmsa, etc. Within a short time frame, by the mercy of his AchAryan, varadharAjar becomes a great expert in sAsthram and writes a grantham named “musalakisalayam” and gives that back to the vidhwAns who chastised him to be illiterate before. He learns bhagavath vishayam, etc from nAyanArAchAn piLLai. His life is a perfect example of how AchArya katAksham can bring one up to great heights. Soon, he develops total detachment and accepts sannyAsa Ashramam and accepts the name azhagiya maNavALa jIyar (sundhara jAmAthru muni). He also defeats many scholars of other philosophies through debates and gets the title “vAdhi kEsari” (lion among debators). He writes many granthams which are of great value in our samrpadhAyam. He writes word-by-word meaning for thiruvAimozhi named 12000 padi (similar in size to srI bhAgavatham which has 12000 slOkams). This is a great work – in all other vyAkyAnams of thiruvAimozhi the overall flow of the pAsuram and the divine emotions of nammAzhwAr is explained. But no other vyAkyAnam, explains the word-by-word meaning which is very essential to understand the pAsurams in a crystal clear manner. His other notable grantham is the thamizh pAsuram for each slOkam in gIthai. He explains the principles explained in gIthai slOkams in simple thamizh pAsuram. He has also done a number of rahasya granthams. His sishya yAmunAchAryar (who is a descendant of thirumAlai ANdAn) writes a couple of excellent rahasya granthams (thathva bhUshaNam and pramEya rathnam) – both are filled with valuable sampradhAyam principles. maNavALa mAmunigaL, while discussing the various vyAkyAnams for thiruvAimozhi, glorifies vAdhi kEsari azhagiya maNavALa jIyar and his 12000 padi vyAkyAnam in great detail. Let us see upadhEsa rathina mAlai 45th pAsuram in detail. Simple translation: With great love, azhagiya maNavALa jIyar explained the (word-by-word) meanings of thiruvAimozhi in his 12000 padi which is pure (blemishless) using his great intellect, so that every one can speak about thiruvAimozhi in the future. love here means – a) attachment/devotion towards thiruvAimozhi and b) mercy towards jIvAthmAs (he blessed this vyAkyAnam for the upliftment of jIvAthmAs). Even though there are 4 other vyAkyAnams, if there is any doubt in actual meaning for a particular word in the pAsuram, one has to depend on this 12000 padi only. So this is considered as an important vyAkyAnam. 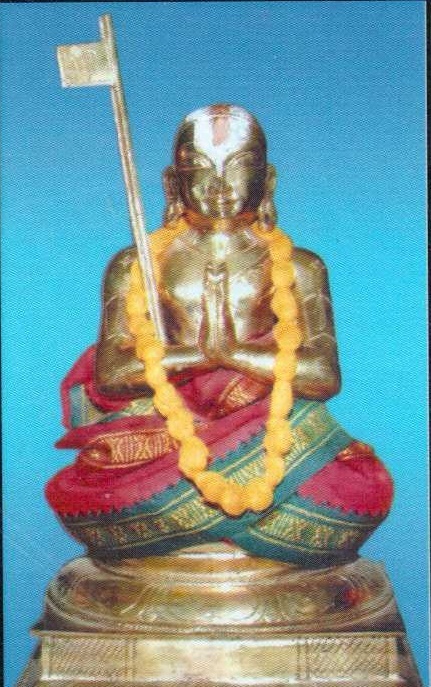 vAdhi kEsari azhagiya maNavALa jIyar’s knowledge/intellect is greatly glorified by mAmunigaL since he was such an expert in thiruvAimozhi and presented the most valuable meanings in a crisp manner. AzhwAr‘s divine emotions are beautifully revealed in this vyAkyAnam as it is. It also perfectly lines up with other vyAkyAnms. For example, where it is brief in piLLAn‘s 6000 padi, this will explain it in detail. Whatever is explained in periyavAchAn piLLai‘s 24000 padi or nampiLLai‘s 36000 padi, this will explain the same in brief. Just like AzhwAr himself declares his pAsurams are Ethamil (pure/blemishless), mAmunigaL declares 12000 padi is pure/blemishless. Thus, we have seen some glimpses of the glorious life of vAdhi kEsari azhagiya maNavALa jIyar. He was fully situated in bhAgavatha nishtai and was very dear to periyavAchAn piLLai and nAyanArAchAn piLLai. Let us pray at his lotus feet that we too get a little bit of such AchArya nishtai. This entry was posted in other AchAryas and tagged vadi kesari jeeyar, vathi kesari jeeyar on March 22, 2013 by sarathyt.